Talk of a stock market bubble is growing louder. These stocks are some of the priciest in the S&P 500. Top professional athletes who rock Under Armour gear command big salaries, and lately, buying the stock of sportswear company also demands a premium price. Investors like to value stocks based on their projected profits, or forward price-to-earnings ratio. Based on that common measure, Under Armour (UA) is the fifth-most expensive S&P 500 stock, excluding real-estate investment trusts (REITs) and sub-$10 billion companies. Under Armour has had incredible ride. Shares of the Baltimore-based athletic wear company have skyrocketed almost 1,900% since tumbling below $3 in March 2009. 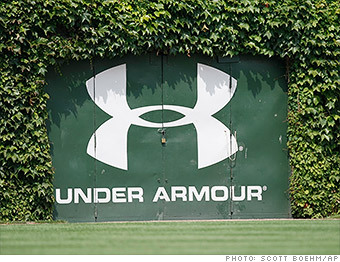 But Wall Street has grown more cautious on Under Armour since its 80% surge last year. Only 39% of analysts who cover the stock have "buy" ratings on it, the lowest percentage among companies in this gallery. And Under Armour is actually trading $2 above Wall Street's average price target of $56.58. That means analysts believe this stock's meteoric rise may take a breather.